I grew up in New Carlisle, OH, about 15 minutes north of Dayton. I lived in a ranch-style, three-bedroom, two-bath home with my mom, dad, older brother, and younger sister. We played outside with neighbor kids, had dinner at the same time every night, went through scouts, played little league baseball, wrestled in high school, had two dogs — a typical Midwestern upbringing. My father owned car dealerships of various types, and he worked pretty long hours. I started washing cars on the lot for him when I was 10. He kept me out of the mechanical aspect of it because he didn't want me to become enamored with the mechanics of cars, but rather with the business of automobiles. At 13, I was detailing cars and working in the parts department, and at 16, I was selling cars. My plan for after high school was to go into the car business with my dad. I envisioned one day having my own dealership. But my father insisted that I go to college before pursuing a career in the automobile business. When I got to Ohio University, my horizons were expanded. I became active on campus. I was the advertising manager for the campus newspaper and chaired the Pop Concert Committee. I decided that I didn't want to go into the automobile business, but rather wanted to pursue a career in the concert/music/entertainment business. I knew it wasn't easy to break into the music business, so I decided to mass-mail my resume to concert promoters throughout the country. I interviewed with several, and in 1979, I accepted a position as promotion and production manager with Mid-South Concerts in Memphis. Back then, there wasn't really a training program for this type of work, so I learned as I went. My training consisted of a two-page, typed instruction sheet and one afternoon with my predecessor. Two weeks later, I'm producing Peter Frampton at the Mid-South Coliseum in Memphis and in Barton Coliseum in Little Rock! I stayed with the company for 14 years, working my way up to vice president. During that time, I became involved in booking talent at regional community festivals, such as Riverfest in Little Rock, Jubilee Jam in Jackson, MS, and Dogwood Arts Festival in Knoxville. This festival activity is what led to my desire for Mid-South Concerts to get involved with Memphis in May. Davis Tillman contacted me in 1988. He was in charge of programming and production for Memphis in May, and he said they were having problems with the music festival. At that time, the festival was still held in nightclubs on Beale Street, along with a main stage in Handy Park. Davis had the idea — since Memphis in May already had a stage up for the barbecue contest and symphony events in Tom Lee Park — of doing one-night programming during Beale Street Music Festival with a big-name artist in Tom Lee Park. Memphis in May was trying to figure out how to keep from losing money on the music festival every year. Pitt Hyde was very active with the festival. 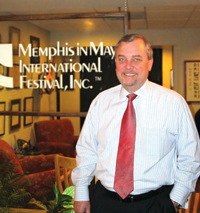 He and Cynthia Ham, the Memphis in May president, formed a partnership with Mid-South Concerts and shifted the focus off of the nightclubs and into Tom Lee Park. Bob Kelley and I started booking talent for the festival and helped make the new arrangement work. I realized that by the nature of this job, I was working on every holiday while everyone else went off to have fun! So I left Mid-South Concerts in 1993. Besides, the regional concert promoter model was starting to go away as a result of industry consolidation. I operated my own company — Holt Entertainment — for three years, working primarily with contemporary Christian artists. I helped develop The Young Messiah Tour in 1990, which is still regarded as the most successful Christian music tour of all time. By 1996, I decided to take some time off and rethink what I wanted to do. In fact, I got out of the concert business entirely. I just didn't see that as my future anymore. In 1997, an associate in Nashville convinced me to go to work at his artist management firm, which specialized in career management of top Christian music artists. I commuted back and forth for 10 months because my kids were here in Memphis. The weekly drive to Nashville got tough after a while. In May that year, I received two back-to-back phone calls the same day from business associates urging me to apply for the newly vacant position of executive director of Memphis in May. The organization was struggling. I thought about it from the perspective that it was probably one of the few positions in Memphis that held interest for me where I could apply my skill sets and knowledge base. I felt I would be able to help the organization get back on its feet and thrive again. In fact, I felt sure I could do it, so I applied. I was hired to lead the festival on Oct. 8, 1998. My initial challenge was working with creditors to resolve the enormous debt the organization had accrued. There also wasn't a particularly experienced staff because so much of the work had been outsourced in the past. So I built a team that had experience, knowledge, and enthusiasm. Diane Hampton, our executive vice president, and Mack Weaver, our CFO, were my first hires and are still with me today. We are going into our 14th festival together this year. I became CEO in 2001, then president and CEO in 2002. During my tenure, the organization experienced asset growth from $10,000 to more than $3 million while gaining widespread recognition and respect within the festival industry and international community. This year, Memphis in May purchased its first permanent home on South Front, and our 14-member staff plans to move in at the end of June. During the festival, my primary role … We have a small staff in terms from an operational perspective, and during the festival, most of them are in the park handling a variety of issues or in the city working various programs in conjunction with the festival. I'm basically holding down the fort here and assisting from the office. On event days, I go wherever I'm needed most. One of the best parts of this job … is being afforded the opportunity to interact with political appointees, entertainers, ambassadors, sponsors, civic leaders, and media. It is a pretty broad spectrum of interesting people. I enjoy the diversity of people I get to communicate and work with throughout the year — from all stations of life and all corners of the world. The most famous person I came in contact with … I don't really think about that. I've worked around celebrities my entire career. In my mind, everyone is important. The Minister of Foreign Affairs from Morocco especially impressed me because of his depth of knowledge in diplomatic and cultural affairs. When I first came on board, I was most surprised by … the absence of an organizational structure. Because there had been so much outsourcing, there weren't benchmarks, documentation, or contacts. I remember thinking, "This organization is being held together by duct tape, baling wire, and a bunch of dedicated volunteers." My favorite "Memphis in May moment" … usually occurs at the fireworks final at the annual AutoZone Sunset Symphony. It's a great month and fun for everyone, but it is always good to see a successful completion. Each year's country is chosen by … a committee of about 12 to 14 members that looks at a wide spectrum of criteria. We choose different areas of the world — this year, an Asian country; last year, we were in Europe; the year before, in Africa; the year before, South America. We choose the country about two years before the festival in which they're honored. People might be surprised to learn … that I had never attended the World Championship Barbecue Cooking Contest or the Sunset Symphony prior to going to work at Memphis in May. One of the "closest calls" I experienced … was in 2002 when we honored Argentina. The country was experiencing a lot of political strife. I think they went through three different presidents after we made the site visit in that country. It was a little dicey. From my father, I got … a strong work ethic and street smarts. Car dealers don't always have the best reputations, but he was one of the most upstanding, honest, and respected men in our community. He treated all people the same — like they were valued and important. A concert production manager is responsible for … bringing together all elements involved in creating the event. When an artist comes into town, the production manager acts as the liaison between the venue and the artist's staff to make sure everything is set up according to what the artist wants. It's physically hard work due to the long hours, which is why I knew I wanted to get out of that aspect of the business when I reached my mid 30s! From my mother, I got … my calm nature and ability to face difficult situations. My parents are both very solid, honorable people. Because of the festival, I never have time to … do springtime yardwork that needs to be done! I do my spring yardwork usually in the first or second week of June. Religion … Growing up, we were an active churchgoing family, members of Church of the Brethren, a German Protestant church. It's not a faith that you see down here in the South. My favorite barbecue place … I have three. First, I have to say that Silky O'Sullivan's ribs are highly underrated. And I like Blues City Cafe and Central BBQ. But we also take people to Rendezvous, Corky's — this city is filled with great barbecue restaurants. When my parents learned I wanted to go into the music industry … Oh, I don't think they were real happy with it. I think they were concerned that I would fall in with unsavory people, but they knew that music was what I wanted to do, so they were very supportive. Although I run the largest festival in North America, I don't like … crowded situations. My first feeling after the festival is packed up and gone is … relief! This is a big deal on a lot of levels. There's a big responsibility and desire from everyone at Memphis in May to put something on that everyone in the city will enjoy and be proud of. It's a very long month for our staff, and it takes a while for people to recover. My board service includes … formerly, the Riverfront Development Corporation, Memphis Convention & Visitors Bureau, NARAS, and Memphis Board of Governors. Currently, I serve with the International Festival & Events Association. Wet or dry? … Wet. My children … I have four grown children and three grandchildren. My kids were the primary reason I stayed in Memphis. They did not want to move to Nashville in 1997 when I was making the weekly commute. That said, there is something special about our city that really takes hold of you. I moved here 33 years ago, and I can't imagine living anyplace else. One of my bigger concerns during the festival … is the safety of everyone who participates. In that park, we roll through 100,000-plus people at the music festival, 70,000-plus at barbecue, and another 15,000 for Sunset Symphony — that's a lot of people going through there. Yes, people are having fun, but things can happen. Items left on my bucket list … Oh, tons! My top one, I guess, would be to travel through Europe, Asia, or South America on a leisurely basis for about two or three weeks. My international trips with Memphis in May are extraordinarily interesting but always hectic and filled with meetings. I've seen some amazing sights — briefly, from the backseat of a van. Memphis in May awards include … 115 prestigious Pinnacle Awards from the International Festival & Events Association, as well as Blues Music Festival of the Year from the Blues Foundation and Volunteer Organization of the Year from Volunteer Memphis. My final 2 cents … Memphis is a great place to live and work and an even better place to visit for a weekend or week. There is no better time to visit (or live) in our city than during the month of May.